The iconic Mercurial, re-designed for the modern day superstar, these Nike Mercurial Vapor Academy Junior FG Football Boots in Thunder Grey, Black and Dark Grey have been built for speed and performance. Wrapping your foot perfectly the moulded 1 piece upper sits snugly around the foot moulding to your feet straight out of the box, giving you the killer instinct that's been missing from your game. 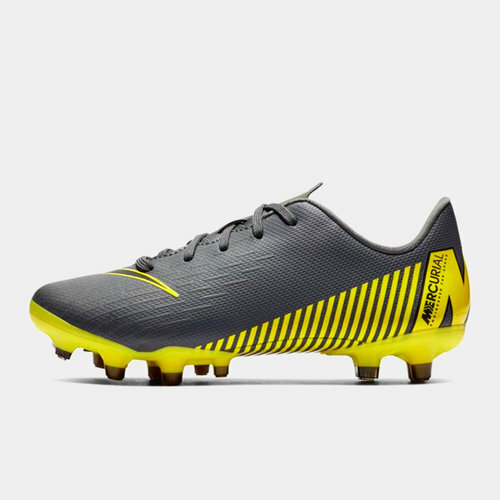 These boots are designed for you to utilise your speed thanks to their lightweight design, whilst the cushioned insole reduces stud pressure for complete comfort throughout your game. The lightweight, low cut collar enables freedom in every stride. These Mercurials have moulded conical and chevron studs for exceptional traction, whilst the full lace fastening allows you to get a secure fit.